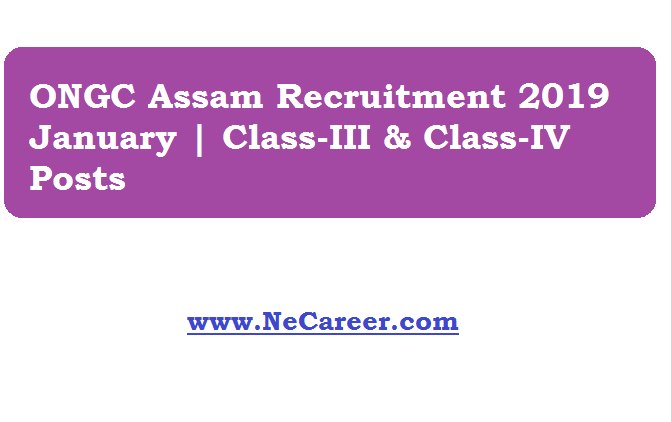 ONGC Assam Recruitment 2019 January | Class-III & Class-IV Posts :- Hello everyone ! Welcome to North East India's No. 1 Job Portal www.NeCareer.com . Today we bring a new job notification in ONGC Assam. Oil and Natural Gas Corporation Limited (ONGC) Assam has issued a job notification in the month of january 2019. 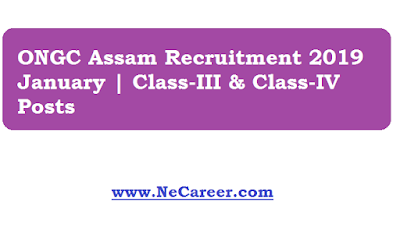 According to the recruitment , Oil and Natural Gas Corporation Limited invites Online Applications from young and energetic Indian citizens possessing Assam state domicile for selection to the under mentioned posts for ONGC’s offices in Assam with the pay scales as mentioned below aginst Advt. No: 01/2019 (R&P) (For Non-Executives). The details of the vacancy is mentioned below. Educational Qualification: Graduate with proficiency in typing speed at 30 wpm and shorthand at 80 wpm. Certificate/ Diploma of Computer Applications of minmum 6 months duration. Educational Qualification: Diploma / Certificate of minimum one year duration in Anaesthesia Technician. Minimum 01 year inline experience. Educational Qualification: Diploma / Certificate of minimum one year duration in Operation Theatre Technology. Minimum 01 year inline experience. 3. PWD candidates: Upper age limit is relaxable by 10 years. c) Rs 10.000-18,000/ - for W1 level (Class-IV), with an increment of 3% per year. iv. SC/ST/PWD/Ex-Servicemen candidates are exempted to pay any fee. i. The selection of the candidates shall be done through a Computer Based Test (CBT) followed by PST/PET/Skill tests wherever applicable. The candidates have to qualify at each stage separately. ii. The Computer Based Test (CBT) is tentatively scheduled from March 2019 onwards. iii. The test will be held at Jorhat, Dibrugarh, Guwahati, Silchar and Sivasagar subject to availability of suitable infrastructure for CBT. iv. Candidates should indicate their choice of test centre in the online application. v. ONGC reserves the right to change any of the aforementioned test cities at its discretion. vi. Details of the schedule of CBT shall be shared with the candidates separately. vii. SC/ST/PWD candidates attending the written test and whose mailing address is beyond municipal limits of the test city will be reimbursed to & fro second class rail/bus fare of the shortest route from their mailing address. The candidates must possess the domicile of state of Assam. The candidates will have to produce a Certificate of Domicile from the concerned state at the time of Skill Test/ uploading of documents. The condition of domicile is not mandatory for departmental candidates. In case the candidate is eligible for multiple posts, the candidate will have to give his choice of posts in order of preference. No change in the order of preference will be considered later. Only one offer of appointment shall be given to the selected candidate based on his/ her choice of preference indicated in the online application. The Candidate must possess the essential prescribed qualifications on or before the last date of online Application. Candidates must possess a minimum score of 50% marks in the essential qualification to be eligible. The candidate has to enter exact percentage of marks to a maximum of 2 (two) decimal places while filling the online application form i.e. rounding off to percentage is strictly not allowed. For the posts mentioned above where one of the qualifications prescribed is a Certificate/Diploma of minimum duration of 6 months in Computer Applications in the Office Environment, a B.C.A. or an M.C.A. or a B.Tech. / B.E. in Computer Science/ Engineering shall not be accepted in place of a Certificate/ Diploma of minimum 6 months. Even if the Graduation is B.C.A. or, a B.Tech. / B.E. in Computer Science/ Engineering, the required certificate of minimum duration of 6 months is mandatory. The Certificate/ Diploma should be attributable to Computer Applications and should clearly mention that the candidate has studied the course involving office environment such as applications of MS Word, Excel (spread sheet) etc. Eligible candidates would be required to apply on-line ONLY through the link available on ONGC Website: www.ongcindia.com from 07.01.2019 to 06.02.2019 till 1800 hrs.